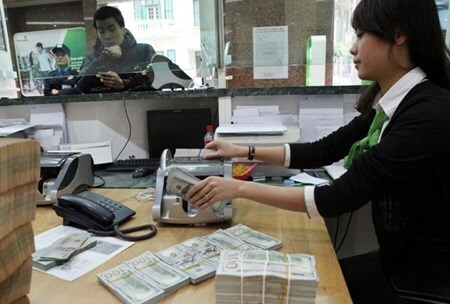 Hanoi (VNA) - Domestic commercial banks plan to recruit thousands of employees this year to boost development and seize new opportunities, business news website cafef.vn reported. After recruiting more than 2,100 personnel last year, Sacombank said its recruitment demand this year would be roughly 2,500 employees to replace personnel who have retired and to supplement the sales force. A representative of Sacombank said the bank would focus mainly on employees those who directly deal with individual and business customers, besides consultants and those involved in transactions such as tellers. Pham Phu Cong, Recruitment Director of the Human Resources Management Division at Techcombank, said the bank recruited 1,850 personnel annually, of whom 65 percent were new graduates, while the rest were middle managers with experience. The majority of new recruits are assigned to the sales department and customer care services that are given special attention by the bank to provide the best customer services. Smaller banks also do not miss these development opportunities. An ABBank representative said the bank hired more than 200 employees every year, but it would need nearly 400 new recruits for its branches and headquarters in 2016. This is good news for the banking system as many banks have been forced to cut thousands of jobs in the past few years, except in 2015, due to the economic slowdown and to meet the central bank's restructuring programme. In the past four years of implementing the restructuring programme of credit institutions, banks have had to do comprehensive restructuring, including about personnel. Reports about cuts in salary, allowances and personnel in 2013 and 2014 has been mentioned repeatedly, with several banks such as Maritime Bank, ACB, Techcombank and Eximbank being forced to dismiss hundreds or even thousands of personnel. The number of banks was also cut from 42 to 34 during the period. The situation has improved since 2015. A survey, conducted by the Department of Monetary Forecast and Statistics under the State Bank of Vietnam in Q4/2015, shows that more than half of the credit institutions increased their staff numbers in 2015, as compared with 2014. As reported by banks, several banks such as VPBank, MB, Vietinbank and Sacombank recruited about 1,000 people last year. Banks such as ACB and Techcombank that cut personnel heavily in the previous years also claimed to recruit again. Thanks to last year's growth, the labour demand of the credit institutions is also expected to increase this year.